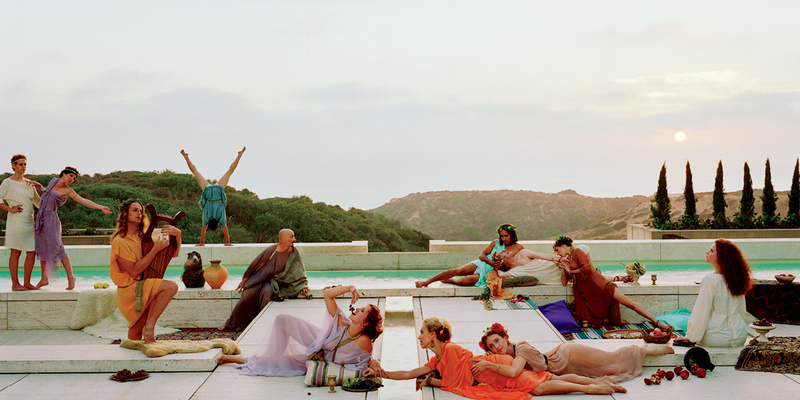 Eleanor Antin, The Death of Petronius, 2001, color photograph, 46 1/2 x 94 1/2". From the series “The Last Days of Pompeii,” 2001. WHERE, EXACTLY, IS LOS ANGELES? Somewhere between the studio lot and the Eagle Rock studio, Chinatown and Chinatown? Between the “playfield of the devil,” as Richard Neutra called it, and the “hyperurban configuration” described by Fredric Jameson? Amid all the endless commonplaces about the city, Jameson’s early-’90s reading still stands out, aptly charting a new disorientation and eclecticism in the buried entrances to the Westin Bonaventure Hotel and in the chain-link chic of Frank Gehry’s Santa Monica house. If over the years Angelenos have gotten used to those swimmingly crossbred spaces, the continual transformations and unmoorings of Los Angeles have nonetheless outpaced us. Indeed, it is the city’s constantly changing tectonics that we hope to explore herenot to definitively locate LA and its culture, but to get lost in its characteristically abrupt stirrings and mixed spaces. On the occasion of the J. Paul Getty Museum’s “Pacific Standard Time,” a confederation of some sixty exhibitions opening across the region beginning this month, Artforum delves into the shifting scenes of postwar LA and the art that has unfolded within them. 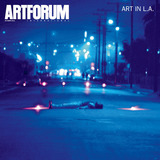 In this issue, artists, critics, historians, and curators speak to a broad array of venues in and around the city: the addresses on Ocean Front Walk and La Cienega where Chris Burden staged performances; the newsstand shelves onto which Robert Heinecken slyly planted altered magazines for unsuspecting readers; the abandoned house that John Divola took over, spray-painted, and shot with flash; the pit dug and molded by Kaari Upson; the studio where Simone Forti danced with Charlemagne Palestine; the street where Asco planted an ersatz gang victim. Further afield and in the present, LA-based artists Burden and Raymond Pettibon contribute special projects for these pages. If time has been the obsession of art historians for as long as history and chronology themselves have been subject to study (see: Nachträglichkeit and chronophobia), this issue hopes to turn to spaceand its purported disappearance. Place no longer exists, or rather, it is shot through with abstract networks of money and information, Jameson wrote; and he held LA to be exemplary of such shimmering finitude. We have tended to fixate on this abstraction, the dissipation of some kind of phenomenological or local sense of space. All is ether, the circulation of capital, the ciphers of control, whether “biopower” or “semiocapitalism.” But to let ourselves go, to submit completely to the idea that both the body and the site have been pulled away into some vortex of abstract power, is to denyor repressthe stubborn persistence of places littered with things and noise and people and rubber and glass, an infrastructure that remains. Instead, we have sought to move through the specific terrain that is Los Angeles and see what we might find there. This is, after all, the city where Artforum had its start, in 1962. Here we pick up the journey once again.